I found this from a dealer at the weekend (cost to me: 33p): an issue of the French Marvel reprint title TITANS from 1981. It caught my eye because the STAR WARS cover isn't one created for either the US or UK editions and was - presumably - specifically created for the translated book. 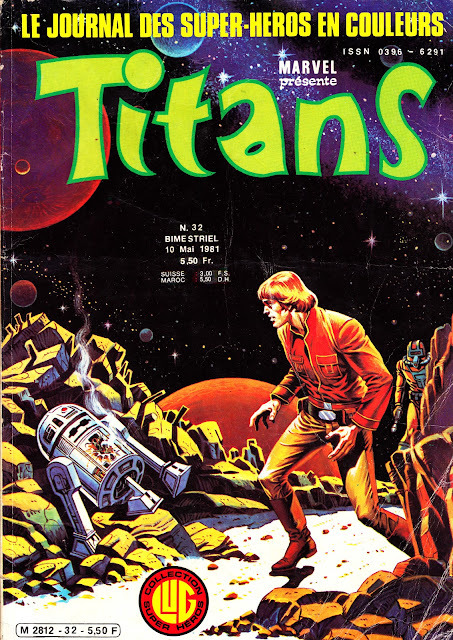 Titans (not to be confused with the UK's TITANS or TITANS POCKET BOOK) puts the Annex of Ideas comics of the time to shame. It's a square bound format, with card stock covers and full colour interiors with a colour printing process superior to the four-colour US monthlies. 26th issue of the US book. The same strip was reprinted (at least) twice in the UK: once, in black & white, in STAR WARS WEEKLY and again - now in colour - in RETURN OF THE JEDI weekly. The uncredited cover is slightly off: not only is R2 obviously off-model but the pre-ESB Luke is suddenly in his Bespin fatigues from the sequel. If you've not read the story before (go seek out the Dark Horse reprints): the guy lurking at the back of frame in a frogman suit is a downed Imperial T.I.E Fighter pilot. I know next to nothing about the history of Marvel's French reprints (or - indeed - anywhere else in Europe) so there's not much more light I can shed. Judging from this issue, Titans was a mixed-genre anthology broadly along the lines of our THE MIGHTY WORLD OF MARVEL. This issue (which also has colour reprints of Machine Man, Captain Marvel and the Invaders) has a bias towards SF strips but I'm sure I've seen other issues with a more traditional superhero line-up so the French publisher was probably just cashing-in on the turn-of-the-decade SF boom. There's even some sort of text feature at the back of the book which - best I can tell - relates to the Disney movie THE BLACK HOLE.